NHS Organisations have a duty to involve patients and the public which includes GP surgeries that are being actively encouraged to set up and support Patient Participation Groups. 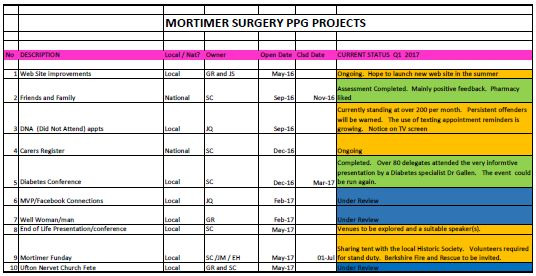 Mortimer PPG was founded in 2011 and meets every six weeks in a closed session. It is comprised of 12 local volunteers (patient representatives) to include a Chair and Vice Chair, Practice Manager and one GP. The group does not handle or receive complaints about the clinical aspects of the surgery but focuses on patient communication, the facilities, appointment making, the Pharmacy, customer service, friends and family surveys etc. and health campaigns like a Diabetes Information evening for example. Presently we are examining the problem of patients who fail to attend their appointments (about 20 per week). Every month all the local PPG's representatives meet to share ideas and best practice, in the presence of staff from the North and West Reading Clinical Commissioning Group (CCG). This way feedback from the surgeries is communicated to the CCG management team for consideration and action. We are currently recruiting for new members so if you would like to be considered for a place in the group then please contact us. The Mortimer Patient Participation Group is a representative body of registered patients at the surgery. Every effort is made to include patients of all ages, gender and ethnicity. This year the group identified the major issues as improving the access to the surgery via the telephone system. A survey was conducted which obtained the views of over 407 patients who visited the surgery. The survey, which included many other questions regarding GPs, nurses and reception staff is published on this website. As a result of the survey it was decided with the group that the practice would investigate the possibility of purchasing a new upgraded telephone system in order to improve telephone access. The practice is currently in the process of viewing different telephone systems and will hope to make its decision in the Spring of 2014.